Examples, Solutions, videos, worksheets, games and activities to help students learn how to solve 2-step word problems using bar models in Singapore Math. Bar models are similar to tape diagrams used in Common Core Math. 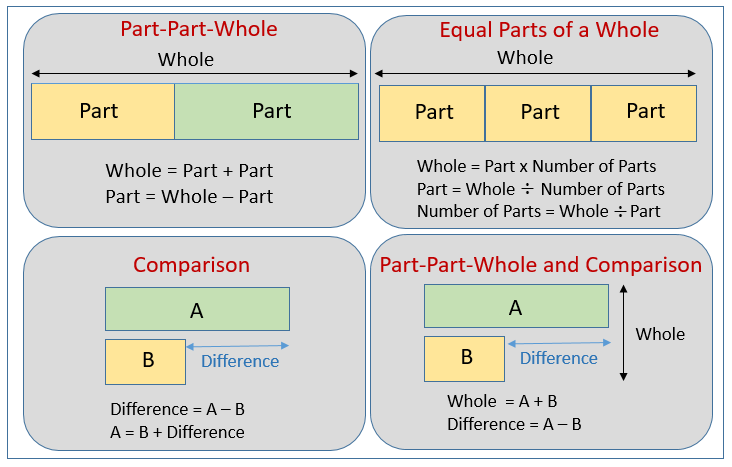 The following diagrams show the Part-Part-Whole Models and Comparison Models. Scroll down the page for examples and solutions. 1. Jamie picked 17 flowers and Lindsey picked 12. They gave away 20 of the flowers. How many flowers were left? 2. 125 children took part in a mathematics competition. 54 of them were girls. How many more boys than girls were there? 3. Ali collected 137 stamps. He collected 27 stamps less than his sister. How many stamps did they collect altogether? This presentation shows how bar models are used for simple word problems. 1. 30 apples were harvested from a plantation. 5 were rotten. How many good apples were there? 2. At a fruit store, there were 250 oranges. If 100 were small oranges, how many big oranges were there? 3. Shop A sold 50 shirts in January. Shop B sold 25 more than shop A in the same month. How many shirts did they sell altogether? 4. At Clara's art exhibition, 120 visitors came on the first day. 20 fewer visitors came on the second day. How many visitors came to the exhibition on the two days? How to solve a simple 2 step word problem using Bar Models? A washing machine costs $700, It costs $800 less than a refrigerator. Find the total cost of the two items? 50 children attended the birthday party. 13 children left during the first hour. 9 children came in during the second hour. How many children were at the birthday party then? Dad bought two hammers. One cost $18, the other cost $28 more. What was his total bill? Kim has 78 boxes of apples and 130 boxes of oranges. She sells some boxes of oranges. Now she has 159 boxes of apples and oranges left. a) How many boxes did she have at first? b) How many boxes of oranges did she sell? Rowan and Emma each had an equal number of popsicles. Rowan had twice as many as Emma. How many popsicles did they each have at first? Peter bought 32 chocolate bars at 4 for $3. He ate 2two of them and sold the rest at 3 for $4. How much money did he earn?